Beautiful French birds eye maple dresser/desk in a bamboo style. The top drawer is secret, and can only be opened by a hidden button in the desk. The desk opens to five beautifully matched drawers. There are three full drawers below the desk, plus another hidden drawer at the very bottom. This wonderful piece of furniture measures 52" tall x 27" wide x 16" deep. It is in great condition. This basked is American, circa 1880. It is white with blue ruffled trim, and has what appears to be mica is the glass. The handle is clear, and it is quite large, measuring 9 1/2" tall x 11" wide and 7 1/2" deep. It is in perfect original condition. This lovely quarter sawn oak hall tree is one of the nicest we've had. Standing 6'8" tall, it has a beveled mirror with four hooks and a covered bench. It is beautifully carved and in excellent condition. The width is 3'6", and the depth is 1'6". It is a great piece for any hallway. I've never seen one of these before, and we've had many hall trees. This unusual and beautiful one is solid walnut made to fit into a corner of a room. There are two mirrors, one on each side, a small shelf and a place for umbrellas as well as hooks for coats and/or hats. It measures 7'8" high and has a width of 30". From the corner, it measures 20" out on each side. 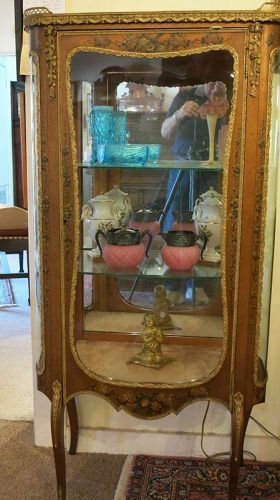 Lovely petite hand painted curio cabinet with glass door with bronze trim and "J" shaped side glass, also with bronze mounts. It measures 54" tall x 26" wide x 15" deep. It is beautifully hand painted with a musical and flower motif. 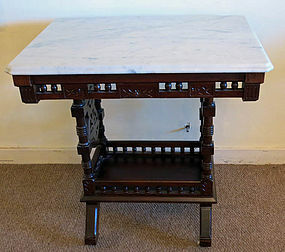 This is a lovely American Victorian marble top table with walnut and burl. It measures 28" x 20" x 30" tall and is in perfect original condition. Beautifully made walnut American Victorian night stand with marble top. Made and signed under the marble by R. Renwick & Son of Baltimore, Maryland. 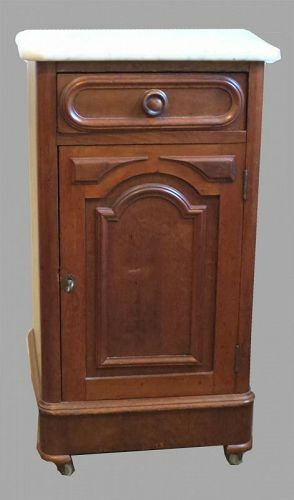 R. Renwick was a cabinet maker to the wealthy, (see article in photos) and his workmanship was the finest in the area. The measurements on this table are 31" tall x 17 1/2" wide x 17 1/2" deep. Lovely walnut oval parlor table with white marble top and nicely decorated base, circa 1880. In excellent original condition. Unusual American Victorian hanging fixture with both shade and font decorated with a log cabin on a lake. 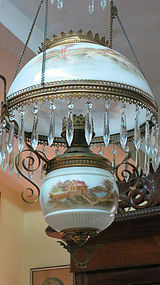 I've never seen this one before, and it is a lovely hanging lamp in perfect original condition. The shade measures 13 1/2" in diameter x 7 1/2" high, and the lamp measures 42" from top to bottom. American Victorian walnut & burl table, measuring 30" wide x 22" deep x 30" tall. In perfect condition. Lovely American Eastlake walnut parlor table, made in the 1880s. It has a white marble top, and an great base with a gallery around it. It measures 30" tall x 31" wide x 23" deep and is in excellent original condition. 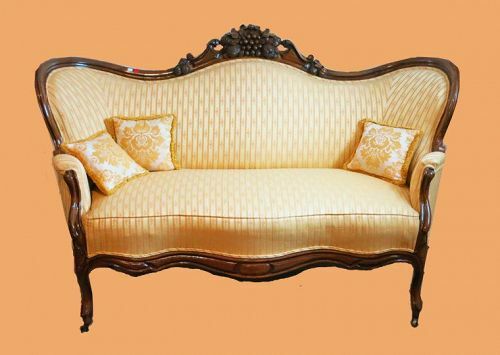 Lovely petite American rosewood settee, circa 1880, hand carved with fruit and nuts. The yellow upholstery is in perfect condition and compliments the settee perfectly. It measures 40" tall x 64" across x 32" deep. 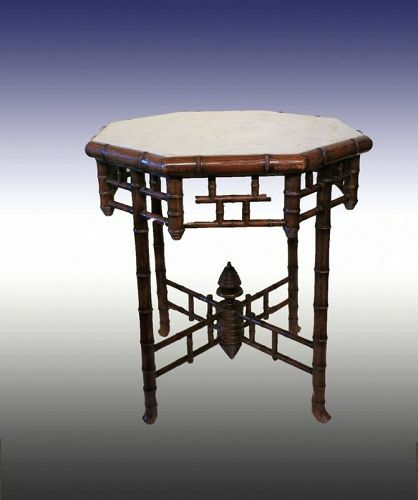 Octagon sided marble top table with an oriental style to the base. 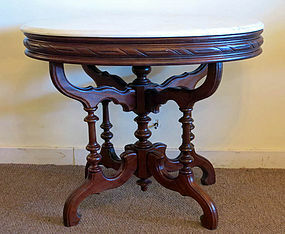 This is a simple but beautiful table, measuring 29" tall x 27" in diameter. The marble has two small chips, both in corners, and both not noticeable unless you look very closely. It is in very good condition for its age, which is late 1800s. 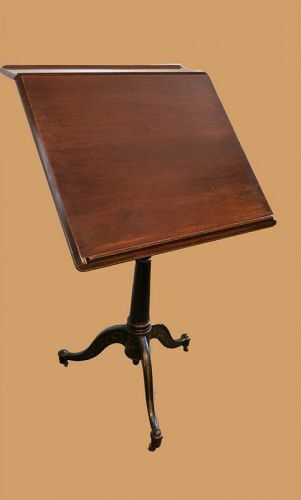 Lovely walnut marble top Victorian table, circa 1880, measuring 29" tall x 35" wide x 25" deep. 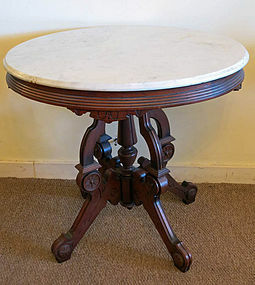 Having a white marble top, this table is in excellent original condition. 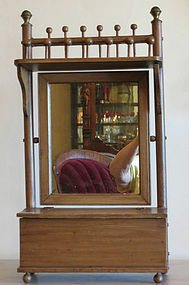 Small Victorian stick and ball wall shelf with a mirror on top and a hinged box on the bottom. This cute little shelf has brass tops and is grain painted. It dates fromthe early 1900s, and measures 23" tall x 12" wide x 5 1/2" deep.